Do you want to start a kitten nursery at your local rescue and don’t know where to start? Do you have a kitten nursery up and running but need advice on how to solve a particular problem or deal with any issue? We prepared the comprehensive “how to” manual, Launching and Operating a Successful Kitten Nursery, which is available at no cost from our website. We traveled to five leading kitten nurseries around the United States and listened to what they had to say about what works, and what doesn’t work. Supplementing that wealth of advice with our own extensive knowledge of how to care for at-risk kittens, this manual provides detailed information about how to set up a sustainable nursery and how to care for the kittens in it. The National Kitten Coalition, with a NKC co-founder and bottle baby expert at the helm, assisted the Animal Welfare League of Arlington (Virginia) in 2017 in setting up its first kitten nursery, using a vacant supply closet as its dedicated space and a budget of just $10,000. This project started with regular NKC workshops over the course of the year leading up to it to train up an expanded pool of kitten fosters. As a result, AWLA was able to increase the number of kitten foster homes by 68 and the number of kittens in foster care by 72 percent. AWLA finished the year having cared for more than 350 kittens in the nursery- up from the 92 kittens the previous year- and with a kitten live release rate of 92 percent! The impact of the nursery was felt beyond AWLA’s “back yard” to the shelters and rescues that were able to send kittens to AWLA for care. The National Kitten Coalition would love to help you with your efforts to save lives with a kitten nursery. Typically, one of our experts would visit your facility and meet with your staff to assess your needs and your particular constraints, offering some immediate suggestions for things to think about or do. An initial meeting would last three to five hours at an hourly rate plus related travel expenses. If further advice is called for after that meeting, the team would draft a proposed action plan for you, laying out more specific steps you could take to start or improve your kitten nursery. The cost of this follow up action plan would depend on the amount of time needed to complete it. Any follow up visits needed to assist you in implementing the plan or in evaluating its success would be charged at hourly rates plus related travel expenses. Please feel free to contact Marnie Russ, Nursery Consulting Services Director, at info@kittencoalition.org to discuss our services in more detail and how they may be beneficial to your organization. 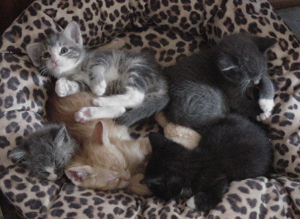 “The kitten nursery at Animal Welfare League of Arlington was a life saver this year! Our organization… does TNR year round and we can always count on finding orphaned young kittens under the age of 8 weeks and of course bottle babies. We have always had to make the hard decision to leave them in the field until we found a foster with the knowledge to care for them.